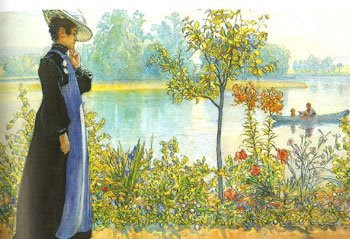 Karin by the shore, watercolour by Carl Larsson; she seems to be contemplating the handsome lilies, almost past their prime. Is there any thing more essentially "Swedish" than Carl Larsson's paintings and drawings? In Sweden and maybe even in the rest of Scandinavia, we are so familiar with his art from the turn of the previous century, that we almost don't even think about it; there it is, as part of the cultural and visual landscape, seducing the eyes with its beautifully curved Art Nouveau lines and harmonious colours. It is easy to forget that Carl's paintings depicted surroundings that were quite avant garde for their time and that they really don't represent a typical Swedish home from the turn of the previous century. 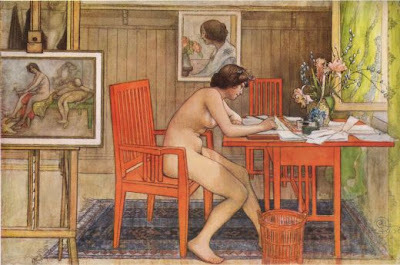 Karin in the atelier, watercolour by Carl Larsson. 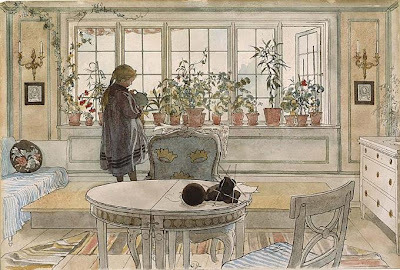 This year, it is 150 years since the birth of Karin Larsson, Carl Larsson's wife. She was an trained artist and had met Carl while painting in France. They married in 1883 and after their first child (of eight in total) was born in 1884, Karin put her paintbrushes aside, giving her full attention to her home and family. In 1888 the family moved to Lilla Hyttnäs in the village of Sundborn in Dalarna, about 230 km North-East from Stockholm. Their house with its gardens became the center of Karin's creativity, and she filled her home with colourful embroideries, weavings and practical furniture of her own design. In addition, she loved her garden and decorated her home with exotic plants and artistic flower arrangements. Flowers on the windowsill. From the book "A Home" (26 watercolours in total). Plants include pelargoniums, clivia, oleander, ivy and Christmas cactus (Schlumbergera). Model with postcards, watercolour 1906. Note the beautiful springtime flower arrangement with soft pink tulips and willow branches. Although often thought as quintessentially Swedish in their style, both Carl and Karin were very much inspired by John Ruskin and the Arts and Crafts movement founded by William Morris, as they subscribed to The Studio, a magazine that spread these ideas and aesthetics. Just like many of their contemporaries, they admired Japanese art, which was made accessible during this period through prints. In Carl Larsson's paintings, we are actually looking at Karin's designs through Carl's skillful brushwork. It is interesting to see, how the influences above lead to so different results; Karin produced abstracted, strong and quite "pre-modern" designs, often with vegetative motifs for textiles and furniture, while Carl executed his paintings in a highly ornate, intricate but airy style. The only area where Karin's style reminds of Carl's is in her delicate flower arrangements, like Dalecarelian origami combining both wild and garden flowers. Still, their combined contributions created a perfectly balanced and harmonious whole. 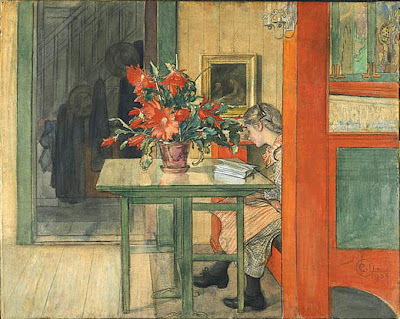 Lisbeth reading, watercolour 1904. Note the blooming Christmas cactus (Schlumbergera). 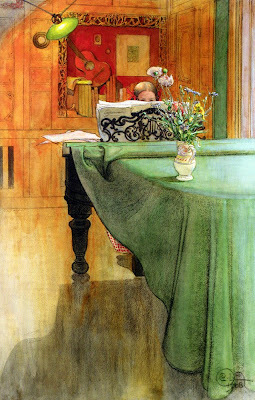 Brita at the piano (1908); flower arrangements by Karin are almost always present in Carl Larsson's paintings. Letter-writing (1912); what a lovely and practical green flower shelf designed by Karin Larsson. 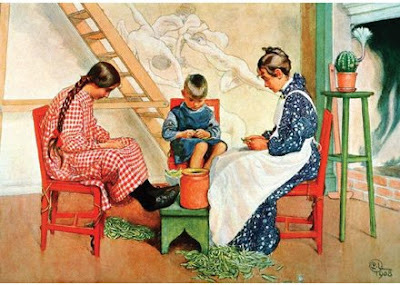 At the time when Karin and Carl Larsson were active, a new, quite well-off middle class had developed as a result of industrialism during the 19th century. During this period, many of these well-off (but not necessarily rich) people fled from the the crowded and filthy cities to the undisturbed nature; many artists, as writers Selma Lagerlöf and Ellen Key, painter Anders Zorn, and Karin and Carl, are good examples. Even whole residential areas, like Djursholm and Saltsjöbaden outside Stockholm, were built to provide healthy and beautiful surrounding to families that could afford them. The garden fashions in Sweden underwent a considerable change, as the needs of these people were not just growing plants for food, but to spend time and entertain in their gardens. Garden became a place to relax, to eat, to work and to play; it needed to have places to sit and large trees to provide shade when the sun became too strong. The idea of "a wild garden", promoted in England by William Robinson, took ground in Sweden during this time; flowers were allowed to grow freely in meadow-like beds, even if more structured borders were typical around the house. Karin had also a large kitchen garden; in France she had seen and tasted vegetables not usually grown in Sweden, and included these into her garden and greenhouses. Some of these were asparagus, tomatoes, different kinds of lettuce, black radish, rhubarb, chervil, sorrel, strawberries and many more. Karin also grew a large variety of Mediterranean plants like pelargoniums, myrtle, nerium oleander, agapanthus and camellia, all pictured in full bloom in Carl's paintings. The Bridge (1912); with beautiful icelandic poppies flowering in the front. Harvesting time in the kitchen garden; Shelling peas (1908). Note the handsomely blooming Echinopsis in the background. It was actually Karin who gave Carl the idea of picture their home and gardens in his paintings. Books and reprints about their home were produced in large editions, and the original aquarelles were presented at the Stockholm exhibition in 1897; very few homes have had such a huge publicity. Karin's ideas on interior design, colours and gardens were trendsetting at the time and continue even today to inspire people all over the world. There has been many exhibitions of the Larssons' work, the most well known of which might be the one arranged by the Victoria and Albert Museum in London in 1997. This spring and summer, Sofiero Palace and Gardens in Helsingborg in Southern Sweden are celebrating Karin as an artist, craftswoman and expert gardener with an exhibition called "On the Sunny Side at Sofiero" (30 May - 27 September 2009). It will be interesting to see Karin herself in focus at last, and get a closer look at her world and work. 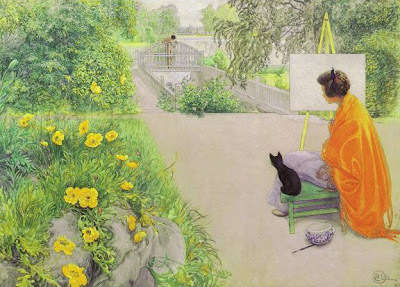 More about Carl and Karin Larsson: Carl Larsson gården Sundborn. Exhibition "On the Sunny Side at Sofiero". Wonderful essay! It's nice to see the women in these artist partnerships get there due, even if it takes a while. So often their art was set aside at least partially to care for the family and the husband got to keep working. I have seen CL's work everywhere without ever knowing his name! Such a big Scandinavian community here. As for the plants in your garden that may or may not make it, the ones on the edge of hardiness here (phormium, rosemary, hebe) may have succumbed to the hardest winter in a long time. I think we tend to push it and get a little cocky about their survival. I wouldn't count them out quite yet, though! Thank you for this post. I love Larsson's work but didn't know much about him or his wife. I am glad that Karin was able to continue to express her creativity even after having 8 children. She mustn't have slept much! Please post more of you great knowledge of art and garden history and please give a lecture some time. I would enjoy it so much. Thanks, Karen; I've been having a huge cold & keeping inside, so it is nice to write these "nostalgic" things... It is so true about many female artists, but eight kids (seven of which survived) would keep anyone busy - I'm reasonably busy with just two... I'll cut the phormiums down and see if something is coming up; it is such a pity though about the large rosemary bush, as I was already used to snipping branches from it to my cooking! 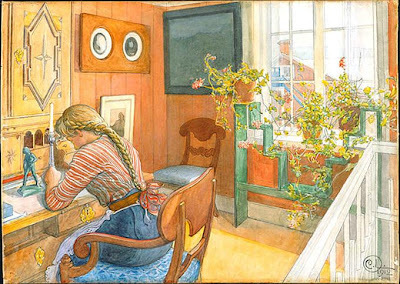 I always loved the images of Carl Larsson as a kid, growing up with quite a lot of negative comments from others on the images, they were "falsely romantic", "not realistic", and representing "a bourgoise haven" etc. Silly, I find them a loving portrayal of a family really enjoying their lives and their house and graden. Perhaps it was just too far away from the concrete reality of the 1970's. I also find them excitingly modern in their composition, as if taken spontaneously with a camera – love that half little head behind the piano. I know his wife was very active designing, and it's an odd thing that her work seems to live on mainly through her husband's paintings. Jean, thank you so much for your words; I just love writing and I like this spontaneous media of blogging. I am very interested to see more of Karin Larsson's work, I'll try to get a copy of the catalogue for the exhibition to share with you, I'm sure it will be a feat for the eyes too. Camellia, I also remember my parents generation admiring CL's work but at the same time being a bit "too cool" to admitting it, as it was considered so decorative and "easy". I also love the compositions, they remind of the japanese ukiyo-e prints in their beautifully own way, having a strong feeling of catching a special moment on them. Hi Alice Joyce and nice to have you visit my blog. I'm not so active on BLotanical for the moment; it seems that I have more than enough just with writing and keeping my blog... I loved your postings from Barcelona on your blog; it is such a beautiful place! A wonderful post about Karin Larsson. A great woman of her time. I love the watercolours. You have written so well and informative about her life. Hi! Thanks for sharing this. I learned a lot about Karin Larsson, and her works are gorgeous. Your work is very informative and well-written. Great job!